One Move and You're Dead! More than 80 puzzles have been specially selected by two experts for their levels of excitement and contribution to the greatest mind game of them all. This guide to chess chooses the most dynamic and destructive tactical patterns, positions where the winning move forces instant checkmate, resignation or decisive advantage. Quite often such climaxes are the result of sustained and prolonged attacking pressure, and the final move may be make or break, where the winner has already burned boats by sacrificing material. Players have to choose the one move that causes the destruction of your partner. All of these games are real, and many are absolute classics that have been overlooked for one reason or another. 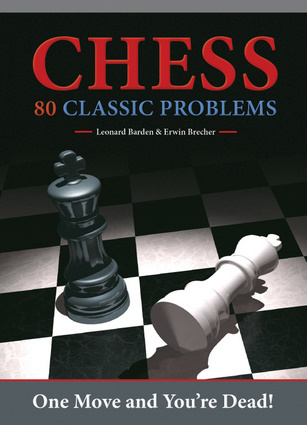 Erwin Brecher is the author of more than 20 books on non-fiction subjects, including many chess, bridge, and puzzle books. Leonard Barden is a chess writer and player. He was British co-champion in 1954 and was Bobby Fischer’s partner in the only consultation game Fischer ever played. He has written chess columns for the Guardian, the Evening Standard, and the Financial Times for more than 50 years.